Gymnastic exercises incorporate the usage of your body weight with highly difficult movements that requires tremendous upper body and core strength. Successful implementation of the following workouts will greatly improve your overall strength, give you a shredded body and increase your body coordination. The parallel bar l-sit is a static exercise that will develop your triceps, shoulders and abdominal muscles. Situate your body as shown in the image and test yourself by seeing how long you can hold this position. You can find a bar at many parks and gyms around neighborhoods. Doing hand stands on a parallel bar requires great coordination as well as strong arms, shoulders and core strength. If you are a beginner, try doing handstands against a wall and have your feet rest on it. Once you become more comfortable, transition into doing handstands without the wall’s assistance. Leg swings on a pommel horse is one of the first moves taught. With a firm grip on each handle, swing your body side to side. Make sure to have the leg, on the same side you are swinging towards, kick high in the air. The pommel horse scissor movement is a direct transition from the previously mentioned leg swing exercise. Alternate swinging a leg forward and backward as you support your weight on the pommel horse’s handles. Make sure to time the swinging of your leg with the releasing and re-gripping of the handle. Just like the other two pommel horse exercises, this movement will increase your upper body and core strength. As indicated by its name, keep your legs placed together and swing them in circular motions over the pommel horse. Maintaining a good rhythm between your swings and the switching of your handle bars grip is crucial for constant movement. Gymnastic rings provide a high level of difficulty due to the amount of coordination, balance and strength needed to fight against its unstable nature. Before starting the other gymnastic ring exercises, try this workout to prepare yourself for the more difficult movements. With your feet planted on the ground, lean back and do pull ups as exhibited in the picture above. This action will develop stronger back, biceps and stabilizers muscles. This exercise is the next stage of getting you adapted to gymnastic ring workouts. It is recommended that you find low hanging rings or use a raised platform to get you in the position on the left. Next, drop down to the second position and start doing dips as you would with parallel bars. This dip exercise will enhance your triceps, shoulders, chest, abdominal and upper body stabilizer muscles. Positioning your body as shown in the image demands a ridiculous amount of core and grip strength. To begin, grab a hold of the gymnastic rings and lean back with your feet resting on an elevated platform. Proceed to lift your feet off the platform and position your body parallel to the ground. Afterwards, incorporate a pedaling motion to this horizontal body hold position. This added movement will transition your static core exercise to one that engages all abdominal muscles. In addition to the amazing core workout are stronger biceps, back, chest and shoulder muscles. If plank exercises on the ground are too easy for you, challenge yourself with planks on the gymnastic rings. With your body weight solely supported by your grips on the rings, this exercise intensifies your upper body muscles as well as targets your abdominal muscles. This L-sit is an advanced movement of the l-sit on the parallel bars, mentioned in the beginning, and it builds on the strength and skills needed. The gymnastic rings require a high level of body coordination and integration of the upper body stabilizers to keep yourself still during this pose. If you do not have gymnastic rings yet, you can get them on Amazon. Gymnastic rings are a great way to build upper body strength because it forces you to maintain stability and balance while you are working out. It’s around $30 and will enable you to do most of the exercises on this list. 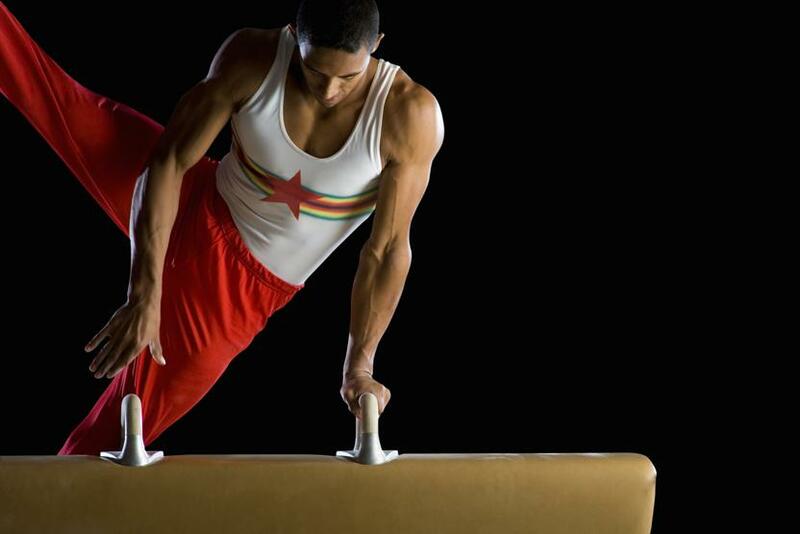 If you are ready for pommel horse exercises, you can get a pommel horse from Spalding. But just a word of warning, they aren’t as cheap as gymnastic rings so you should really be committed to gymnastic strength training before getting a pommel horse. And if you are ready to start tumbling training, you can start by getting a couple of 4’x10’x2′ mats to start off and move on from there.